Daifuku, which means “great luck” in Japanese, are small round pieces of mochi which are filled with a sweet filling, usually sweet red bean paste. Mochi is the name for a special type of sweet, glutinous rice that has been pounded down into a sticky, stretchy confectionery. Mochi is another traditional sweet in Japan, but tastes even better when it is filled with delicious sweet red bean paste like these daifuku! 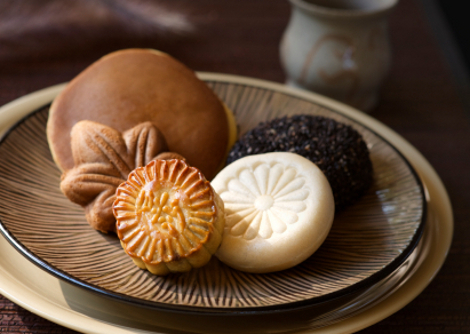 Dorayaki, which means “baked gong” in Japanese due to the similar shape, is a type of Japanese pancake. Rather than just a single pancake, dorayaki is at least twice as tasty as it is made by sandwiching sweet red bean paste in between two pancakes! These also come in a variety of flavours, another popular example is made with sweet Japanese water chestnuts.